In celebration of the Oscars this weekend, an approximate “Top Ten list” of my favorite movie moments; it should be noted, we’re not talking favorite films necessarily – although some on my Top Ten list are represented here – rather those singular moments. In some cases the moments are scenes, in others just a single shot. 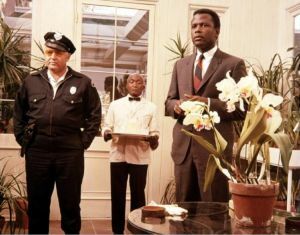 Sidney Pontier, Larry Gates, Rod Steiger – the slap; powerful for its time, and probably one of the first instances of an person of color showing strength, resolve, and dignity that I can recall seeing in popular culture. Directed by Norman Jewison. Stanley Tucci, Tony Shaloub, Marc Anthony – the final kitchen scene, all one take; I wish more American films would embrace the power of simply rolling camera and pointing it at a group of actors so immersed in their characters that we will sit spellbound watching them eat breakfast (understanding that there is subtext – a reconciliation happening just below the surface). Directed by Campbell Scott. Paul Newman, the summation (“today you are the law”); written by David Mamet. Directed by Sidney Lumet. William Holden and Faye Dunaway – when Diana breaks up with Max (“why is it that a woman always thinks that the most savage thing she can say to a man is to impugn his cocksmanship?”); written by Paddy Chayefsky; Directed by Sidney Lumet. This entry was posted in Commentary, pop culture and tagged movies, Oscars, showcase by admin. Bookmark the permalink.